The souvenir is an integral part of the travel experience and most tourists return home with souvenirs to preserve and commemorate such experiences. However, souvenirs and souvenir retailing is for the most part an untapped field of research. This research investigates the marketing strategies implemented by gift/souvenir shops and whether differences are found between Canada (Quebec and Ontario regions) and the United States (Vermont/New York region). The findings suggest that differences exist in the marketing strategies of gift and souvenir shops in these three regions. 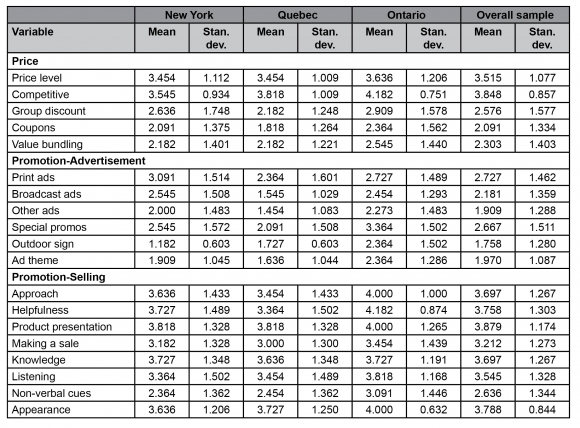 The marketing strategy ratings for product, price, promotion, and place were consistently higher for Ontario gift shops, followed by New York, and lowest for Quebec. The qualitative findings provide some insight into the specific variables that contribute to these differences. Gift and souvenir shop owners may benefit from identifying best practices that differentiate the Ontario stores and make their marketing strategy more appealing to visitors. This may provide useful guidelines for implementing changes to improve their marketing strategy. souvenir, marketing strategies, cross-border, Canada, United States. 1The souvenir is an integral part of the travel experience and most tourists return home with souvenirs to preserve and commemorate such experiences. Souvenirs might take the form of T-shirts, authentic handcrafted items, antiques, key chains, miniature replicas of landmarks, or various other objects. According to Swanson and Timothy (2012), producing, selling, and buying souvenirs are routine activities of tourist destinations that generate billions of dollars each year. While shopping is seldom mentioned as the primary reason for travel, it is perhaps the most universal of tourist activities, and has important financial impacts on local tourist shop merchants (Kent et al., 1983). Shopping is now recognized as one of the major activities of tourists (MacCannell, 2002; Snepenger et al., 2003); it is often the most significant expenditure category on their vacations and trips, representing about one third of their total tourism expenditure (Littrell et al., 1994; Meng and Xu, 2012). 2However, souvenirs and souvenir retailing is for the most part an untapped field of research (Swanson and Horridge, 2004). To attract tourists and persuade them to extend their stay, a better understanding of tourist shopping behaviours and pleasing shopping environments is essential (Kemperman et al., 2009). Successful marketing strategies of gift and souvenir shops require the development of a marketing mix (product/service, place, price, and promotion) that will best satisfy travelers’ needs. This research was conducted to explore marketing strategies implemented by gift/souvenir shops and to examine the similarities and differences in gift shop marketing strategies in a cross-border region. The ultimate goal of this research is to provide insight into more effective gift shop retail marketing strategies in Quebec, Ontario, and New York in order to heighten tourists’ satisfaction with their travel souvenirs. 3The word “souvenir” originates from the Middle French “(se) souvenir (de),” meaning “to remember,” which again comes from the Latin word “subvenire,” meaning “to come up, come to mind” (Van den Hoven and Eggen, 2005). Tourists tend to collect material objects as souvenirs to make their memories tangible. After the journey, these souvenirs serve as symbols of the travel experience and evoke memories. The objects gain and lose meaning after the completion of a journey (Collins-Kreiner and Zins, 2011). This phenomenon is consistent with a broader, widespread decrease in the sentimental value of objects, and also appears to stem from repeated trips abroad and the transformation of international travels into common events. After multiple journeys abroad, tourists acquire fewer souvenirs and even ascribe less meaning to the ones they acquired during previous trips. Travel for some has become less meaningful, and the significance attributed to souvenirs has decreased. For others, the trip and the memories are still extremely significant, but they no longer have the need for tangible souvenirs. Authenticity of the souvenir (e.g., Littrell et al., 1993): understanding what visitors perceive as being authentic about tourist arts and crafts through criteria such as product uniqueness, cultural and historical integrity, esthetics, quality of workmanship, the artist’s connection to the product, being able to watch the artisan create products, the craft’s utilitarian function, local production, cost, scarcity value, and guarantee of authenticity by way of a label or certificate. Commodification of souvenirs (e.g., Swanson and Timothy, 2012): souvenirs are viewed as material commodities for trade in tourism. They are produced, sold and consumed; they are distributed through supply chains from their point of production and packaging, shipment and distribution, to their final point of sale, and eventually are consumed by tourists. Craft production, gender and economic development (e.g., Hume, 2009): focus on the traditional role of women as producers of handicrafts and souvenirs, and how manufacturing souvenirs can empower women socially, psychologically, and economically. Cultural property rights (e.g., Gutentag, 2009): ethical issues regarding the reproduction and selling of indigenous arts, crafts, and symbols by non-native producers and intermediaries. Souvenir messages and meanings (e.g., Collins-Kreiner and Zins, 2011): souvenirs hold different meanings for their owners; tourists visiting the same destination leave with different souvenirs, which reflect their experience largely based on their own identity in relation to the destination, as well as their depth of knowledge about the place. Consumer behaviour (e.g., Swanson, 2004; Swanson and Horridge, 2004): define travel consumers using predictor variables such as tourism types, travel activities and motivations, authenticity, souvenir product characteristics, and attitudes toward shopping for souvenirs. Several close links have been found between nationality, cultural characteristics, and the types of goods and souvenirs purchased by tourists. Gift-giving (e.g., Kim and Littrell, 2001): souvenirs perform the role of evidence or proof of travel, and gift-giving rituals, of appreciation or reciprocation to those who maintained responsibilities at work or at home in the traveler’s absence. In some cultures, souvenir gift-giving is an expected part of returning home from a trip. Shopping and retail (e.g., Moscardo, 2004; Timothy, 2005; Hu and Yu, 2007): key research themes include conceptualization of the retail process, analysis of marketplace retailers, shopping as a tourist activity, understanding shoppers’ motives and experiences, and souvenir consumption. Souvenir retailers face unique challenges in determining consumer demand and sustaining operations. 6Since the focus of this research is on the marketing strategies of gift and souvenir shops in Canada and the United States, the findings will contribute new knowledge in the last category of the literature, shopping and retail, as we discuss below. 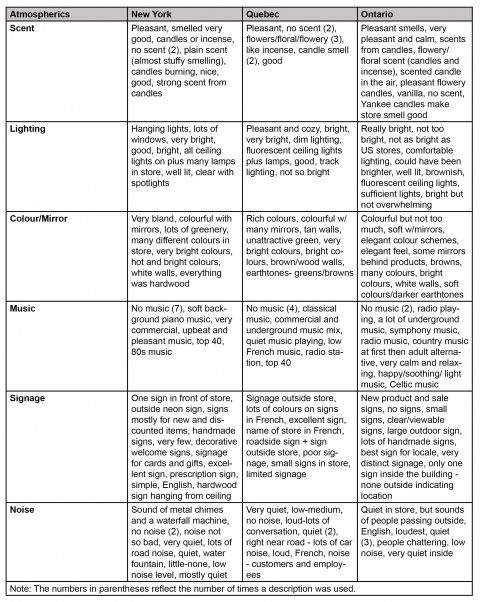 7According to Moscardo (2004), there are different types of tourist shoppers, and the patterns of souvenir purchases are related to more general travel motives. This author distinguishes between two core types of motives for shopping: instrumental and expressive. Instrumental motives for shopping serve three purposes: shopping for souvenirs to meet social or cultural obligations; shopping for life necessities; and shopping as a way of experiencing the local culture. The expressive motive refers to those situations where shopping as an activity is the desired experience or an end in itself, such as relaxation, escape, social networks or status. Although tourists enjoy spending time and lingering in stores, they also seek a utilitarian value in shopping (Yu and Littrell, 2005). Besides creating attractive process-oriented shopping experiences, tourism retailers should therefore also strive to provide crafts with functions and uses, offer high-quality merchandise at reasonable prices, and train their sales associates with sufficient knowledge to help consumers accomplish their shopping tasks, if requested. Active outdoor tourists, who enjoyed a range of active, outdoor, nature-based pursuits and who sought souvenirs associated with these outdoor activities. Indifferent shoppers: lack of interest in shopping and smallest market share, thus representing the lowest profitability in average shopping expenditure and lowest frequency in purchasing tourism products. Shopping lovers: the largest and highly profitable segment, but with variable spending on tourism products. This segment is more appealing to mass marketers who incorporate shopping as one of several travel activities at a destination. Enthusiastic shoppers: are worth pursuing by tourism practitioners as a niche market because they are highly profitable, but they are more demanding of craftsmanship, cultural linkage, and sensuous appreciation. 10Country of origin of tourists has also been found to influence tourist activities and shopping behaviour (Witkowski and Yamamoto, 1991; Rosenbaum and Spears, 2005). Other researchers have examined the nature of the consumption process for tourists while on holiday and have found that the tourist’s situation accentuates the affective over the cognitive role in tourist consumer behavioural choice and experience, which can be perceived as comparatively risky to the individual in everyday life, but would seem to be the primary sought consumption experience while on holiday (McIntire, 2007; Yuksel and Yuksel, 2007). 11Product selection and in-store atmosphere should match target shoppers’ expectations, since these can influence tourists’ emotions and behaviours related to shopping (Timothy, 2005). Because tourism is focused on hedonic and pleasurable experiences, shopping can be viewed as entertaining or recreational by consumers, and the emotional characteristic of the shopping experience can be linked to important outcomes, for example increases in time spent in the store, spending, unplanned purchases, and attraction for the store (Jones, 1999). Since tourists’ shopping intentions and actual purchase behaviours are influenced by various indicators, including planned behaviour, impulsive behaviour, and experiential consumption factors (Meng and Xu, 2012), gift and souvenir shops with a well-planned marketing strategy can better steer these behaviours to their financial benefit. 12Tourists and residents define the meaning of a place by actually being at the place, consuming products and services at the place, and through their interactions with others at the place (Snepenger et al., 2007). From this perspective, the gift and souvenir retail shop takes on more meaning in the travel destination experience of travelers beyond the traditional retail shopping role. Since the greatest part of the tourism product is intangible, shopping for souvenirs as mementos of the destination provides a tangible object symbolizing the experience for visitors themselves and for their relatives and friends. The gift of souvenirs can be a means of supporting a relationship with others in social psychological perspectives (Kim and Littrell, 1999; 2001). Tosun and his colleagues (2007) found that these self-gifts and gifts to relatives and friends help travelers share their experiences, and serve as trophies (or proof of travel) in their homes or offices, and they suggest that providing a higher level of shopping experience for tourists and increasing the contribution of shopping to the regional economy require supporting indigenous, local people to fabricate and retail authentic handicrafts and souvenirs. 13Swanson and Horridge (2004) propose a structural model for souvenir consumption that includes souvenir products, product attributes, store attributes, and travel activities. They found that the travel activities of tourists all have a positive correlation with souvenir consumption, while tourist demographics have none. Furthermore, travel activities influence store attributes, including location and promotion, image and sales associates, and price and selection. According to these authors, this finding has several implications for retailers. First, retailers should be aware of their retail space, making sure it is appealing. Second, store layout and design, department identification, and merchandise display, among other elements of the store image, should be promoted. Third, retailers should hire knowledgeable, friendly sales associates representative of the store image. Fourth, retailers should use in-store special events to attract tourists in the store (e.g., special sales, free gift with purchase, artisan demonstration, highlighted local products). Swanson and Horridge (2004) also found that “markers (mementos of location) and toys” do not contribute to the souvenir products variable and are deleted from the structural model of souvenir consumption. Therefore, retailers should closely examine their merchandise selection and consider offering a larger selection of books on the area, attractions, arts and crafts, local foods, collectibles, and antiques, and offer less markers (e.g., mementos, T-shirts, postcards.) By better understanding the relationship between tourists and their retail needs, tourism-based retail businesses may increase revenues and the economic activity of a host area (Swanson, 2004). 14The above literature suggests that the retail marketing strategies of souvenir shops contribute to visitors’ travel experiences and satisfaction and provide general directions for retailers’ strategies to enhance travelers’ experiences. The present study contributes to the literature in two ways: it expands the 4Ps of the marketing strategies of souvenir/gift shops with 50 more detailed marketing strategy variables; and it examines and compares souvenir/gift stores marketing strategies through different cultural environments. Identify opportunities for developing more effective gift shop retail marketing strategies in Quebec, Ontario, and New York in order to heighten tourist satisfaction with their travel souvenirs. 17A census of the gift/souvenir shops in three communities in this cross-border region was included in this research. The online Yellow Pages United States and Canada directories were used to identify the sampling frame of gift and souvenir shops in the contiguous geographic regions along the border. The region under study was expanded until 33 retail establishments were identified, that is, 11 from each of the regions: Quebec, Ontario, and New York. The establishments were all located in comparable environments, close to the border. They were generally found in small rural towns or cities, on main streets or rural routes. In most cases, there were no major tourist attractions in the vicinity. The rural tourism experience (e.g., nature, outdoor activities, farmers’ markets, small museums, shopping, etc.) and over-the-border outings draw travelers to these regions. The typical gift shop in this study was an independently owned and operated family business that controlled its own marketing strategy. The establishments were similar in size, for example a standard main street storefront on one level. The gift shops sold a variety of local products such as destination T-shirts, local arts and crafts, local foods (maple syrup and other maple products, jams, candies…), candles, unique household items, collectible items, as well as mass-produced souvenirs with destination name (e.g., keychains, postcards, decks of cards, magnets, etc.). 18A detailed marketing strategy evaluation grid (Héroux and Burns, 2000; Héroux and Csipak, 2001; 2005; Héroux, 2002) was used to collect detailed, qualitative, observational descriptions, and quantitative data of the gift/souvenir shop marketing strategy variables. “Marketing strategy” refers to the target market of the establishment and the marketing mix variables designed to attract these customers. The marketing mix variables are categorized according to the popular 4Ps framework: product, place, price, and promotion (McCarthy and Perreault, 2000; Perreault et al., 2013). 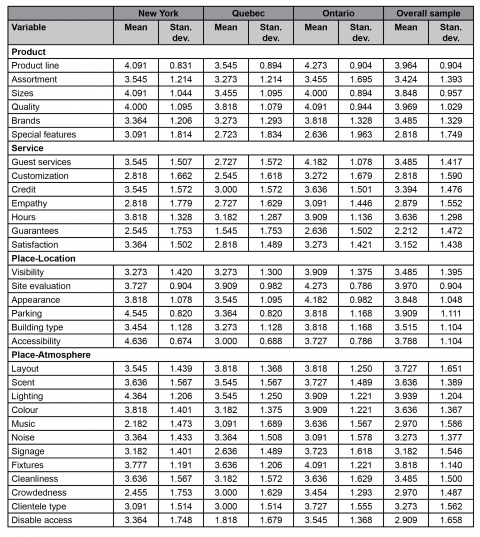 Three of these categories of variables are subdivided in this study to capture the breadth of the categories: “product” consists of product variety variables and service-related variables; “place” refers to the location of the establishment as well as store atmospherics; and “promotion” includes advertising variables and personal selling variables. A detailed marketing strategy evaluation grid was developed from the commonly accepted variables in the marketing strategy literature (McCarthy and Perreault, 2000; Jain, 2010; Lamb et al., 2012; Kotler and Armstrong, 2013; Perreault et al., 2013; Pride and Ferrell, 2014). 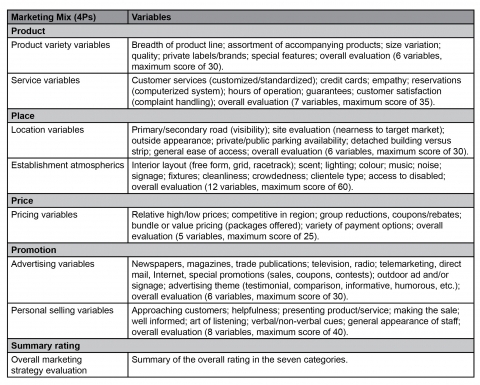 The marketing strategy evaluation grid was used to collect qualitative observational descriptions and quantitative data of the souvenir/gift retail stores marketing strategy variables. 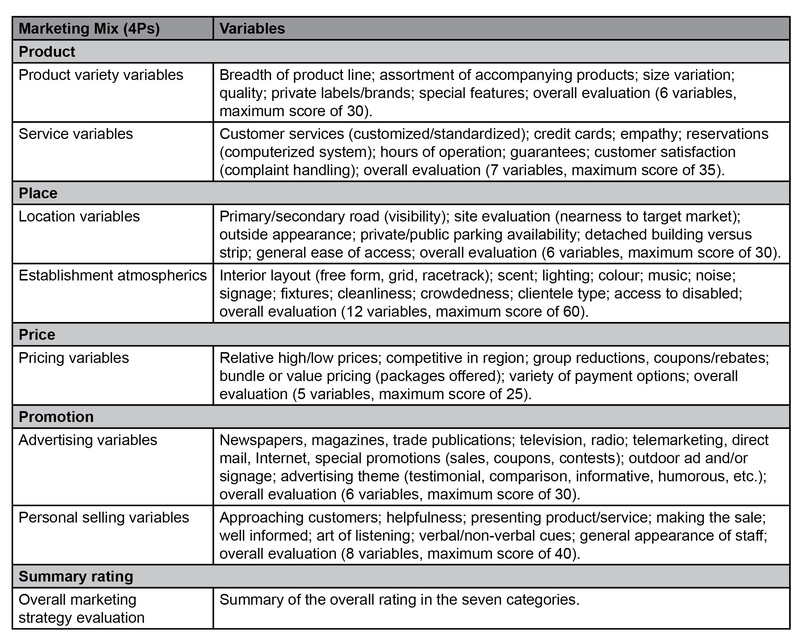 The comparison framework, therefore, consists of three cultural/geographic regions and seven marketing variable ratings (see Table 1). 19The observational research was conducted by international marketing students who were familiar with the marketing concepts. Observers received training on a variety of dimensions of the research process. They were given a detailed explanation of each of the variables in the marketing strategy evaluation grid and how each variable is operationalized. They were shown how to find and approach their assigned gift/souvenir shop, how to record their qualitative observations, and how to determine a quantitative score for each variable (on a scale of 1 to 5, with 5 being superior implementation). For example, for breadth of product line, students would look at the assortment of products on the premises and make a judgment on the rating scale as to its appeal to consumers (5 representing an outstanding assortment, beyond expectations; 3 an average assortment usually found in gift shops; and 1 the minimum one would expect). 20The trainer and trainees performed a “walk-through” of the research process prior to visiting the gift shops to ensure their understanding and consistent implementation of the data collection. Observation and listening were usually sufficient to gather information about each variable. However, if some variables were difficult to observe, students were given guidelines for asking questions to the staff. 21Three trained observers visited each establishment together in all three regions, spending four to five hours in each location to record detailed notes of how each marketing strategy variable was implemented. Then, the three observers had to discuss and come to an agreement on a score (on a scale of 1 to 5, with 5 representing superior implementation of the strategy) for each variable in an attempt to quantify the observational data. Some variables (such as outside appearance and cleanliness of the shop) were more subjective to rate than others (for example hours of operations and credit cards accepted). Having three judges compare their perceptions and agree on a rating helped to reduce the subjectivity of the ratings. Since this process resulted in one rating for each variable, inter-judge reliability measures were not relevant. Each item within a variable category was weighted equally in this research. The data collection thus consisted of qualitative data (the recorded observations) and quantitative data (the scores assigned to each variable). 22The findings are discussed below in terms of both quantitative and qualitative results. 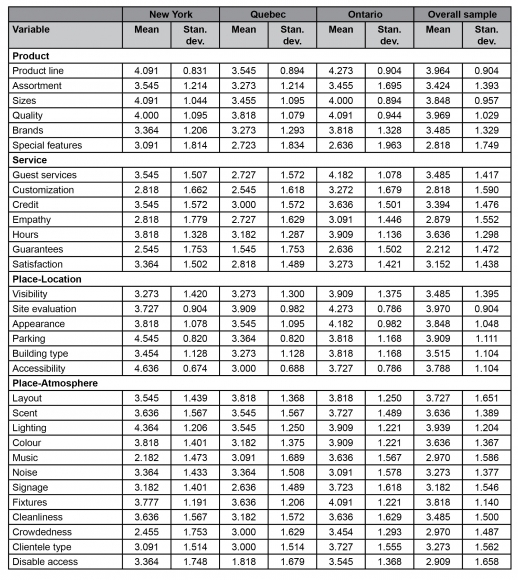 Tables 2, 3.1 and 3.2 present the quantitative results of the scale ratings for each of the seven variable categories. Although tests of significance cannot be realized because of the small number of cases, a closer analysis of these tables reveals that there are more similarities than differences in marketing strategy variables in the three regions. The qualitative results, based on qualitative data recorded by the observers, provide a wealth of information about the implementation of the gift shops’ marketing strategies. 23The souvenir/gift stores in Ontario dominated the study and were evaluated highest or tied for highest on 41 out of 50 (82 %) marketing strategy variables. The marketing strategy variables on which the Ontario stores were rated highest and on which they earned a minimum of 4.0 (out of a possible 5.0) in descending order were: number of product lines (4.273), site evaluation (4.273), location appearance (4.182), guest services (4.182), competitive prices (4.182), helpfulness of sales staff (4.182), product quality (4.091), store fixtures (4.091), product sizes (4.000), personal selling approach (4.000), product presentation by sales staff (4.000), and appearance of sales staff (4.000). The Ontario stores rated highest or tied for highest on all 8 promotion-selling marketing strategy variables and all 5 price marketing strategy variables. The marketing strategy variables on which the Ontario souvenir/gift stores ranked below 3.5 and were rated lower than at least one other state/province were: product assortment (3.455), satisfaction with service (3.273), place-atmosphere: noise (3.091), promotion-print ads (2.727), product special features (2.636), and promotion-broadcast ads (2.454). 24The souvenir/gift stores in northern New York were evaluated highest or tied for highest on 12 out of 50 (24 %) marketing strategy variables. 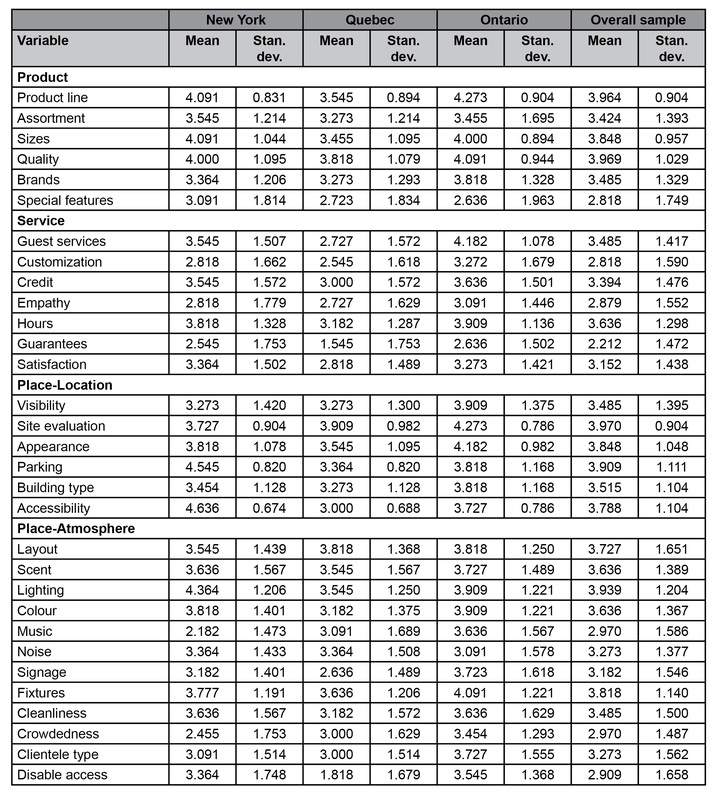 The marketing strategy variables on which the New York souvenir/gift shops were rated highest were: place-location accessibility (4.636), parking (4.545), lighting (4.364), product sizes (4.091), promotion-selling: knowledge (3.727), place-atmosphere: cleanliness (3.636), product assortment (3.545), satisfaction with service (3.364), noise (3.364), product special features (3.091), promotion-print ads (3.091), and promotion-broadcast ads (2.545). The strongest marketing strategy categories of the New York stores were the product and place-location variables. The New York stores’ weakest marketing strategy variables were: crowdedness (2.455), promotion-selling: non-verbal cues (2.364), music (2.182), coupons (2.091), value bundling (2.182), other ads (2.000), ad theme (1.909), and outdoor signage (1.182). 25The souvenir/gift stores in Quebec were tied for the highest score on two marketing strategy variables: place-atmosphere: layout (3.818 - tied with Ontario) and place-atmosphere: noise (3.364 - tied with New York). Although they did not rate higher than the other two state/province on the other marketing strategy variables, their strongest ratings were for: site evaluation (3.909), product quality (3.818), competitive prices (3.818), promotion-selling: product presentation (3.818), place-atmosphere: layout (3.818), appearance of sales staff (3.727), fixtures (3.636), and sales staff knowledge (3.636). The two weakest marketing strategy categories of the Quebec stores were promotion-advertising and service. The weakest marketing strategy variables of the Quebec stores were: special promotions (2.091), disable access (1.818), coupons (1.818), outdoor signage (1.727), ad theme (1.636), guarantees (1.545), promotion: broadcast ads (1.545), and other ads (1.454). 26The qualitative observations regarding product variety revealed the following: (1) Ontario and New York gift shops offered the largest number of product lines and the assortment within their product lines were perceived as slightly higher in most cases. (2) The New York stores were perceived to have the greatest amount of size variations within their product lines, with Ontario stores close behind. Some of the Quebec stores did not offer certain of their products in larger sizes. (3) Ontario stores seem to have a slight edge over American stores on observers’ perception that they sell quality products. Perception of higher quality seemed to be related to handcrafted, custom-made, or branded products, as opposed to mass-produced items. (4) Availability of national brands as well as foreign brands and private label, and handcrafted items improved the perception of a store’s product variety. For gift shops catering to foreign tourists, offering products made in that country seemed to increase the products’ value. Special features mentioned that improved perception of product variety included: personalization of products (New York); one-of-a-kind pieces (Ontario); free gift-wrapping (New York); offering collectible items (New York); offering a set of products (Quebec); and offering hand-crafted Mohawk items (Ontario). 27The qualitative observations regarding services revealed the following: (1) In most cases, observers felt that employees in the Ontario gift shops were friendlier, kinder, and more helpful and attentive. Although rated lower, employees in the New York gift shops were also perceived to be friendly, polite, and attentive to the extent that they told the observers stories and answered all their questions. The store employees in the Quebec gift shops were rated quite a bit lower in customer service. While some Quebec stores offered excellent customer service by greeting customers upon entry and by being friendly and helpful, more observers noted that they were not offered any help. A small number said they were treated rudely. The language barrier may be at the root of this problem. (2) Although the Ontario gift shops had the highest quantitative ratings for offering customized service, the qualitative comments reveal more customized services being offered in the New York gift shops. (3) Gift shops generally accept major credit cards in Ontario, Quebec, and northern New York. One New York gift shop offered its own charge accounts for local customers, while another New York store only accepted credit cards on purchases over a certain amount. Only one gift shop in Ontario did not accept credit cards. (4) About half of all of the stores in this study were open seven days a week. Gift shops that were not open seven days in Ontario, Quebec, and New York were most likely to close on Sunday. In Quebec and Ontario, observers also noted that some gift shops were closed on Saturday and Sunday or Sunday and/or Monday. (5) Store guarantee policies were not as formalized as store refund and exchange policies were for the gift shops in this study. Only one New York store had a 30-day money-back guarantee with receipt policy and one Ontario store said that everything they sold was guaranteed. One Quebec shop indicated that guarantees were handled on a case-by-case basis. Some stores offered either store credits or gift certificates for merchandise exchanged or if the merchandise was defective (3 Ontario, 1 New York), while two gift shops stated they do not allow returns on jewellery (New York and Ontario) or on food and custom-requested items (Ontario). The lower quantitative rating for the Quebec gift shops on (a) guarantees and (b) customer satisfaction may stem from either a lack of formal policies or lack of communication to customers of store policies regarding guarantees, refunds, and exchanges. 28The qualitative observations regarding location revealed the following: (1) There was great variability in the visibility of the locations of the gift shops along primary or secondary roads. Gift shops in Ontario were rated highest on visibility from the road and on nearness to target markets due to being off major highways, in high traffic areas or in shopping malls, or in well-marked areas. (2) The function of the gift shop’s outside appearance is to attract customers in the store. The Ontario gift shops earned the highest ratings, followed by Quebec and then New York stores for outside appearance. The Ontario gift shops were characterized as having newer, more sophisticated, higher-end exteriors, with good signage, and some with decorative window displays, warm colours, lighting, and a welcoming appearance. The New York gift shops rated highest for outside appearance were well lit, neat, clean, and well kept up, homey and welcoming with large signage and attractive product displays in windows and in front of the store. The terms associated with lower ratings for stores were: run-down looking, nondescript, unattractive, painted with “sad colours” (green with yellow letters), sign on window, not able to see inside the store, and nothing special. (3) Of all the marketing strategy variables, the northern New York gift shops were rated highest for parking availability and accessibility with plenty of free parking and ample handicapped parking spaces available in front of stores, on streets, or in shopping mall parking lots. (4) The majority of the Ontario gift shops were located in strip malls, while the Quebec stores tended to be located in detached buildings on “Main Street” or in covered malls, and the New York stores were predominantly located in strip malls or were free-standing stores. 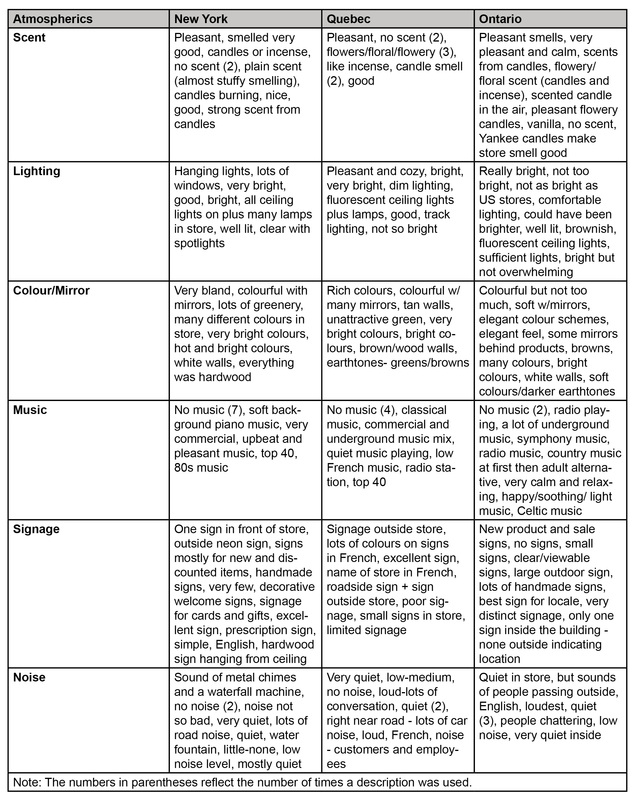 29Regarding the store layouts of the gift shops in this study, almost were judged to have used a free form (boutique) layout, which allows the customer to explore and roam throughout the store since it has no defined traffic pattern (see Table 4). 30The qualitative observations regarding price revealed the following: (1) In all three locations, it seems that gift shops were somewhat unique, and those that offered distinctive products were more competitive in their region. (2) Most gift shops offered products ranging in price from $ 1 to several hundred or thousand dollars. There did not seem to be a pattern regarding which state or province had the highest priced products. (3) Higher priced products were frequently handcrafted products, premium specialty brands, or collectible items. (4) Group price reductions were more prevalent in the northern New York and Ontario gift shops than in the Quebec stores. The New York stores offered discounts to teachers, seniors, students, doctors’ wives, and groups/clubs, while the Ontario stores offered student, sports team, military, musician, and customer appreciation discounts. (5) Special sales and holiday promotions were offered by many of the gift shops to clear out older or distressed merchandise or to gain a bump in sales, but coupons were not a common form of promotion. One New York gift shop gave shoppers a coupon to be used on future purchases that was 10 % of their current purchase. One Ontario store used store coupons. (6) Value or bundle pricing used was observed in all three destinations. The types of pricing observed included: quantity discounts; a discount on a second item; seasonal discounts; and discounts for buying sets of products. (7) The vast majority of the gift shops in this study accepted major credit cards. 31Newspapers were the most commonly used advertising medium, and gift shops in northern New York were found to use newspaper advertising somewhat more than their counterparts in Ontario and Quebec. Magazines and trade publications were used by a very small minority of gift shops. 32Both television and radio advertising were used by less than half of the gift shops in New York and Ontario, but none of the Quebec stores reported using the broadcast media. TV advertising was more popular with the gift shops in northern New York, while radio advertising was more popular in Ontario. A minority of New York and Ontario gift shops used website promotion or the Internet to communicate with customers, even fewer shops used direct mail, and only one Ontario gift shop in this study resorted to telemarketing. 33The Ontario and New York gift shops appeared to use more outdoor advertising and signage than the Quebec gift shops. Most of the shops’ outdoor advertising took the following forms: signs on the buildings, signs at the entrance to shopping malls, sandwich boards, and smaller signs. Only one Ontario store used actual billboards. 34Regarding the type of advertising, New York gift shops used both testimonials and informational ads; gift shops in Quebec used informational, glamorous, and floral advertising approaches, while in Ontario informational, testimonial, comparison, and sensory ads were more common. 35The qualitative observations regarding personal selling revealed the following: (1) In all three regions the observers generally found that they were greeted warmly upon entering the gift shops: the Quebec store employees were most likely to actually approach the customers to greet them while the Ontario and New York salespeople greeted customers from wherever they were located in the store. (2) Employees in most stores were considered to be helpful, although a few stores in New York and Quebec were not found to be as helpful. In Quebec, the observers suggested that most employees did try, but that the language barrier made it difficult in some instances. (3) Presenting the product was one of the highest rated personal selling quantitative variables in all three regions. Enthusiasm was important, and the Quebec salespeople were observed walking the customers around the store to show them products, stressing features and quality (rather than price). (4) In making the sale, the general impression was that the employees were not pushy or hard sell. The Ontario store personnel were rated highest on making the sale, and the observers noted that they were thorough and worked hard to conclude the sale. One Ontario store gave sale coupons to the researchers, which resulted in a large sale. (5) Generally, all store personnel in the three regions were knowledgeable about their products. (6) Observers’ comments indicated that most store personnel were attentive to customers’ questions and concerns. One observer noted that perhaps the Quebec store personnel listened even more carefully in order to understand the customers’ questions in English. Another observer commented that a New York store employee did not make eye contact and did not appear to be listening. (7) Regarding the personal appearance of store employees, they were perceived to be more adequately dressed in Ontario and Quebec than in the New York stores. Employees in two of the New York stores were seen as not being well dressed and in need of improvement. 36This research looked at an extensive number of marketing strategy variables in the souvenir/gift retail store environment. The findings indicate that differences exist in the marketing strategies of gift and souvenir shops in the three regions under study. The marketing strategy ratings for product, price, promotion, and place were consistently higher for Ontario souvenir/gift shops, followed by New York souvenir/gift shops, and then Quebec souvenir/gift shops. The qualitative findings provide some insight into the specific variables that contribute to these differences. For products and services, Ontario shops had better product assortments and better brand selections, as well as more responsive and customized services. They also had more visible locations on primary roads in attractive buildings. Their use of lighting, music fixtures, and signage enhanced the shopping environments and complemented the merchandise well. Their prices were more competitive, and they offered discounts and coupons. For promotion, Ontario souvenir/gift shops tended to offer more frequent special promotions, make more use of outdoor signage, and employ/train their sales personnel to better approach customers, provide helpful information, and actually make the sale. 37Gift and souvenir shop owners may benefit from identifying the variables that differentiate the Ontario stores from the rest and make their marketing strategy more appealing to visitors. They can then complete a self-assessment of their own souvenir/gift shop to determine how it compares, and what changes might be made to improve their marketing strategy. Souvenir/gift shop retailers could use the list of marketing variables in Table 3 to build a template to compare their establishment with their main competitor(s) and find out where their strengths and weaknesses lie. This exploratory research provides insight into the marketing strategy variables. 38The findings also suggest some opportunities for enhancing gift-shop marketing strategies in the cross-border regions. 39The souvenir/gift shops in Ontario seem to have addressed and were rated most positively for the greatest number of marketing strategy variables. The perceived weaknesses in their strategy were limited to a small number of variables. They might consider developing special features showcasing specific products or themes (e.g., maple or apple festival), and pay attention to the noise level in their establishment. As most of the souvenir/gift shops were not rated very high on price reduction strategies such as group discounts, coupons, and value bundling, there may be opportunities to utilize these tactics to increase store traffic. 40The majority of the weakest marketing strategy variables in Quebec souvenir/gift shops in this study regarded the promotion element of the marketing mix. This would suggest that souvenir/gift shops in this cross-border region might consider investing more resources in store promotion. For example, there may be opportunities to conduct special promotions related to a theme or local events, use outdoor signage to increase store traffic, offer tourist coupons for special discounts or a free gift for coming in the store (e.g., free tasting of locally produced foodstuffs, free reusable tote bag with store name, etc.). 41Compared to Ontario and Quebec, the New York souvenir/gift shops rated lower on store atmospherics in the following areas: music, crowdedness, and store layout. Retail stores might pay more attention to using the appropriate music genre and volume. With respect to the personal selling component of promotion, souvenir/gift shops may benefit from better training their staff in listening, picking up on non-verbal cues, and professional dress and grooming. Finally, outdoor signage is critical to attracting tourists and New York stores would benefit from increasing their visibility with better outdoor signage. 42The main limitations of this research stem from both the observers and sampling methodology utilized. On the one hand, the observers were international marketing students in an American university. Since the majority were Americans, the observers may have viewed and compared the souvenir/gift shops through predominantly American eyes. In addition, although there was inter-judge reliability in each of the observer teams, the use of a large number of teams may have resulted in observer variability and inconsistency in how the souvenir/gift shops were evaluated. Future research should consequently attempt to use observers from all three regions to reduce the risk of observer bias. 43On the other hand, although a census of gift/souvenir shops was taken within each of the limited geographic regions, that choice was made based on convenience/judgment sampling: the three rural regions selected were within commuting distance for the researchers and there was significant cross-border tourism in these regions. Hence, the limited geographic area in this research may not be representative of the state/province or country where the shops we investigated are located. 44This research explored marketing strategies as they are currently applied in the gift and souvenir shop industry. More research would be needed to link the marketing strategies implemented in these regions to the retailers’ sales volume and profitability. Research in other geographic areas if these two countries would also be required to extend the generalizability of the findings. Expanding the research to include souvenir/gift shops in large metropolitan areas is likely to produce quite different results. CHURCH, Nancy J. and Lise HÉROUX (1999) “Canadian and American Travellers: Fraternal Twins? An Exploratory Study of Hotel Macro-Choice Criteria,” IN Catherine RALSTON (Editor), Proceedings of the Administrative Sciences Association of Canada Conference, Saint John, New Brunswick, vol. 20, no. 23, p. 22-30. COLLINS-KREINER, Noga and Yael ZINS (2011) “Tourists and Souvenirs: Changes through Time, Space and Meaning,” Journal of Heritage Tourism, vol. 6, no. 1, p. 17-27. GUNN, Clare A. (1994) Tourism Planning: Basics, Concepts, Cases, 3rd edition. Philadelphia: Taylor & Francis, 464 p.
GUTENTAG, Daniel A. (2009) “The Legal Protection of Indigenous Souvenir Products,” Tourism Recreation Research, vol. 24, no. 1, p. 23-34. HÉROUX, Lise (2002) “Restaurant Marketing Strategies in the United States and Canada: A Comparative Study,” Journal of Foodservice Business Research, vol. 5, no. 4, p. 95-110. HÉROUX, Lise and Laura BURNS (2000) “Comparative Marketing Strategies of Bed-and-Breakfasts in Canada and the United States: An Exploratory Study,” IN Nancy J. CHURCH (Editor), Proceedings of the Administrative Sciences Association of Canada Conference, vol. 21, no. 23, p. 21-28. Montreal, Quebec. HÉROUX, Lise and James CSIPAK (2001) “Comparative Marketing Strategies of Motels in Canada and the United States: An Exploratory Study,” in Lise HÉROUX (Editor), Proceedings of the Administrative Sciences Association of Canada Conference, vol. 22, no. 23, p. 35-44. London, Ontario. HÉROUX, Lise and James CSIPAK (2005) “Marketing Strategies of Bars in the United States and Canada: A Comparative Exploratory Study,” Journal of Foodservice Business Research, vol. 8, no. 2, p. 55-72. HU, Bo and Hong YU (2007) “Segmentation by Craft Selection Criteria and Shopping Involvement,” Tourism Management, vol. 28, p, 1079-1092. HUME, David L. (2009) “The Development of Tourist Art and Souvenir – the Arc of the Boomerang: from Hunting, Fighting and Ceremony to Tourist Souvenir,” International Journal of Tourism Research, vol. 11, no. 1, p. 55-70. JAIN, Ashok (2010) Principles of Marketing. New Delhi (India): VK Publications. JONES, Monique A. (1999) “Entertaining Shopping Experiences: An Exploratory Investigation,” Journal of Retailing and Consumer Services, vol. 6, no. 3, p. 129-139. KEMPERMAN, Astrid D.A.M. ; Aloys W.J. BORGER and Harry J.P. TIMMERMANS (2009) “Tourist Shopping Behavior in a Historic Downtown Area,” Tourism Management, vol. 30, p. 208-218. KENT, William E.; Patti J. SHOCK and Robert E. SNOW (1983) “Shopping: Tourism’s Unsung Hero(ine),” Journal of Travel Research, vol. 21, p. 2-4. KIM, Soyoung and Mary A. LITTRELL (1999) “Predicting Souvenir Purchase Intentions,” Journal of Travel Research, vol. 38, no. 2, p. 153-162. KIM, Soyoung and Mary A. LITTRELL (2001) “Souvenir Buying and Intentions for Self Versus Others,” Annals of Tourism Research, vol. 28, no. 3, p. 638-657. KOTLER, Philip and Gary ARMSTRONG (2013) Principles of Marketing, 15th edition. New York, NY: Pearson Education, 720 p.
LAMB, Charles W.; Joe F. HAIR and Carl McDANIEL (2012) Marketing, 12th edition. Independence, KY: Cengage Learning, 912 p.
LITTRELL, Mary A.; Luella F. ANDERSON and Pamela J. BROWN (1993) “What Makes a Craft Souvenir Authentic?” Annals of Tourism Research, vol. 20, no. 1, p. 197-215. LITTRELL, Mary A.; Suzanne BAIZERMAN; Rita KEAN; Sherry GAHRING; Shirley NIEMEYER; Rae REILLY and JaneAnn SHOUT (1994) “Souvenirs and Tourism Styles,” Journal of Travel Research, vol. 33, no. 1, p. 3-11. MACCANNELL, Dean (2002) “Reflections and Reviews: The Ego Factor in Tourism,” Journal of Consumer Research, vol. 29, no. 1, p. 146-151. MCCARTHY, Jerome and William D. PERREAULT (2000) Essentials of Marketing, 8th edition. New York, NY: McGraw-Hill/Irwin, 571 p.
MCINTIRE, Charles (2007) “Survival Theory: Tourist Consumption as a Beneficial Experiential Process in a Limited Risk Setting,” International Journal of Tourism Research, vol. 9, p. 115-130. MENG, Fang and Yingjiao XU (2012) “Tourism Shopping Behavior: Planned, Impulsive, or Experiential?” International Journal of Culture, Tourism and Hospitality Research, vol. 6, no. 3, p. 250-265. MOSCARDO, Gianna (2004) “Shopping as a Destination Attraction: An Empirical Examination of the Role of Shopping in Tourists’ Destination Choice and Experience,” Journal of Vacation Marketing, vol. 10, no. 4, p. 294-307. PERREAULT, William D. Jr.; Joseph P. CANNON and E. Jerome McCARTHY (2013) Basic Marketing: A Marketing Strategy Planning Approach, 19th edition. New York, NY: McGraw-Hill/Irwin, 784 p.
PRIDE, William M. and O.C. FERRELL (2014) Foundations of Marketing, 6th edition. Independence, KY: Cengage Learning, 576 p.
PROKKOLA, Eeva-Kaisa (2007) “Cross-Border Regionalization and Tourism Development at the Swedish-Finnish Border: Destination Arctic Circle,” Scandinavian Journal of Hospitality and Tourism, vol. 7, p. 120-138. ROSENBAUM, Mark S. and Daniel L. SPEARS (2005) “Who Buys What? Who Does What? Analysis of Cross-Cultural Consumption Behaviours Among Tourists in Hawaii,” Journal of Vacation Marketing, vol. 11, no. 3, p. 235-247. SNEPENGER, David J.; Leann Murphy; Ryan O’CONNELL and Eric GREG (2003) “Tourists and Residents Use of a Shopping Space,” Annals of Tourism Research, vol. 30, no. 3, p. 567-580. SNEPENGER, David; Mary SNEPENGER; Matt DALBEY and Amanda WESSOL (2007) “Meanings and Consumption Characteristics of Places at a Tourism Destination,” Journal of Travel Research, vol. 45, no. 3, p. 310-321. SWANSON, Kristen K. (2004) “Tourists’ and Retailers’ Perceptions of Souvenirs,” Journal of Vacation Marketing, vol. 10, no. 4, p. 363-377. SWANSON, Kristen K. and Patricia E. HORRIDGE (2004) “A Structural Model for Souvenir Consumption, Travel Activities, and Tourist Demographics,” Journal of Travel Research, vol. 42, no. 4, p. 372-380. SWANSON, Kristen K. and Dallen J. TIMOTHY (2012) “Souvenirs: Icons of Meaning, Commercialization and Commoditization,” Tourism Management, vol. 33, no. 3 p. 489-499. TIMOTHY, Dallen J. (2005) Shopping Tourism, Retailing and Leisure. Clevedon, UK: Channel View, 232 p.
TOSUN, Cevat; S. Pinar TEMIZKAN; Dallen J. TIMOTHY and Alan FYALL (2007) “Tourist Shopping Experiences and Satisfaction,” International Journal of Tourism Research, vol. 9, no. 2, p. 87-102. VAN DEN HOVEN, Elise and Berry EGGEN (2005) “Personal Souvenirs as Ambient Intelligent Objects,” EUSAI Conference Proceedings, Grenoble, p. 123-128. WEIDENFELD, Adi (2013) “Tourism and Cross Border Regional Innovation Systems,” Annals of Tourism Research, vol. 42, p. 191-213. WITKOWSKI, Terrence H. and Yoshito YAMAMOTO (1991) “Omiyage Gift Purchasing by Japanese Travelers in the US,” Advances in Consumer Research, vol. 18, p. 123-128. WOODSIDE, Arch G. and Chris DUBELAAR (2002) “A General Theory of Tourism Consumption Systems: A Conceptual Framework and an Empirical Exploration,” Journal of Travel Research, vol. 41, no. 2, p. 120-132. YU, Hong and Mary Ann LITTRELL (2005) “Tourists’ Shopping Orientations for Handcrafts: What Are Key Influences?” Journal of Travel and Tourism Marketing, vol. 18, no. 4, p. 1-19. YUKSEL, Atila and Fisum YUKSEL (2007) “Shopping Risk Perceptions: Effects on Tourists’ Emotions, Satisfaction and Expressed Loyalty Intentions,” Tourism Management, vol. 28, no. 3, p. 703-713.